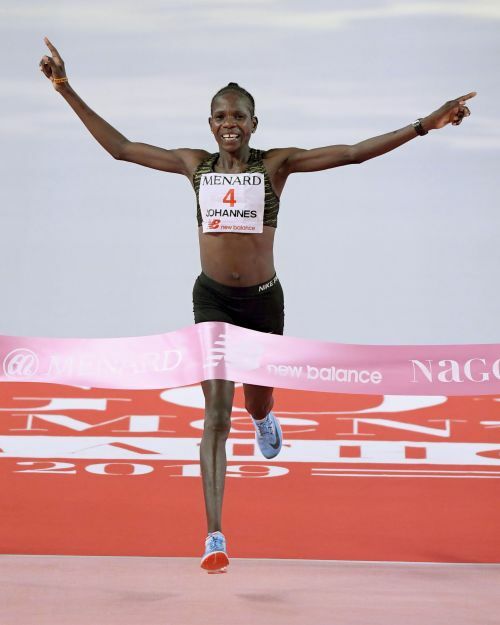 NAGOYA, Japan (AP) — Helalia Johannes of Namibia won the Nagoya Women's Marathon on Sunday, upsetting Kenyans Visiline Jepkesho and Valary Jemeli. Johannes, the 2018 Commonwealth Games champion, broke away from the two Kenyan runners after 41 kilometers and crossed the finish line at Nagoya Dome to win in 2 hours, 22 minutes, 25 seconds. Jepkesho (2:22:58) and Jemeli (2:23:01), moved to the front around the 35-kilometer mark and finished second and third. Meseret Defar of Ethiopia was fourth followed by Reia Iwade who finished fifth for Japan's best result. The 35-year-old Defar, who has won two Olympic and world championship gold medals at 5000 meters, clocked 2:23:33.